My neighbors down the street got married the other day. It was a simple yet elegant affair, held on the front lawn of their tidy Spanish-revival bungalow. Now that California has legalized gay marriage, they were able to confirm their long-term relationship in a ceremony in the eyes of the state, and in front of their friends and family. Even their “girls,” three little dogs they walk every morning before work, which is when we run into them on the way to school, were groomed and in attendance. What better occasion to try out my Mexican wedding cake cookie recipe? Here’s a recipe adapted from Epicurious. It’s more or less the same recipe my mom sent me, back when I asked her about the bourbon balls. God only knows where she got it from. The back of Reader’s Digest? These are also known as Russian tea cakes. I live closer to Mexico. Using an electric mixer, beat the butter in a large bowl until light and fluffy. Add 1/2 cup powdered sugar and the vanilla. Beat until well-blended. Beat in the flour (amazingly, I was so distracted at this point I almost forgot this part, and wondered what I’d done wrong to make the mixture so sticky. Duh.) Then your ground nuts. Divide the dough in half, roll into a ball, wrap in plastic and let chill in the fridge for half an hour. Preheat the oven to 350. Whisk remaining 1 1/2 cup powdered sugar and cinnamon into a small bowl. Set aside. Take half the chilled dough, pinch off roughly two teaspoons and roll into balls, placing 1/2 inch apart on parchment paper. Bake until golden brown on bottom and just pale golden on top (about 18 minutes). Cool cookies for five minutes on the baking sheet, then drop them into the sugar mixture, covering them completely. Transfer these coated cookies onto a cookie rack, and let cool completely. Makes about 4 dozen. Because I was feeling daring, I added a few drops of rose water to the batter. And 1/8th teaspoon of cardamom powder to the sugar/cinnamon mixture. The results: Delicious. My kids were incredulous that I made such delights. So was I, truth be told. Naturally I went for the overkill, and tried to line a little basket with multi-colored tissue paper, for that rainbow effect, and fill it with the cookies. It was a little twee, but I’m sure the guys appreciated the sentiment. 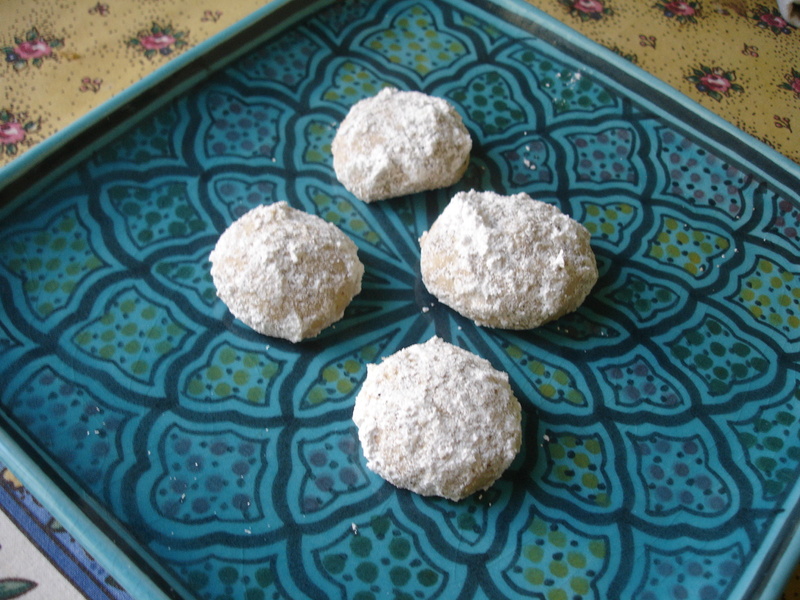 Oooh, I love Mexican Wedding Cake Cookies… I think I may have to try this one out! ooohh i *love* russian tea cookies /mexican wedding cookies. no wonder i love them, they have 2 sticks of butter in the recipe! i’m scared of baking, but these look so good i’m inspired to fight the phobia! They sound good. I’ll have to give them a shot. I love those cookies. I haven’t made them in a long though but after seeing the picture, I think I’ll be making them soon! YUM! Interesting mexican wedding cake i wanna taste it. Those are some really nice looking cookies, thanks for sharing!